1965 – Began private instruction in painting, drawing and water color. 1966 – First public showing of work on Long Island. 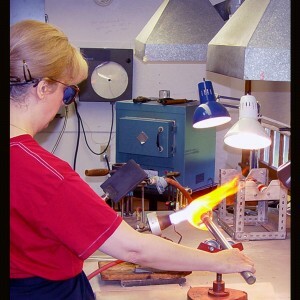 1974 – Began to create glass flameworked objects on a torch. 1975 – Started Tarsitano Studio in partnership with my father, Delmo Tarsitano, making simple paperweights with traditional floral motifs. 1980 – Developed complex floral designs including compound paperweights and plaques with different designs encased on several levels. 1984 – Designed optical effects with master cold worker Edward Poore, of Sagamore Ma. to reinforce interior motifs through the use of cold working. This transition introduced the use of faceting and surface treatments to connect an exterior surface design with the interior flameworked design. Also creating optical illusions which transformed the interior design. 1988 – Created a large scale engraving, entitled “Witness to the Battle,” which combined external engraving, internal flameworked designs on a triptych of crystal plaques to express a larger idea (The start of the American Revolution at Lexington and Concord, Mass.) This was followed by a major work (entitled The Outstretched Hand of Liberty) which tells the story of immigration into the United States on a series of nine engraved plaques with flamework encasements. Flamework becomes a method of expression beyond the mere portrayal of flowers. It is now a tool to create drama and tell a story. 1994 – Incorporated portraits of Mother Teresa and Ann Frank into engraved plaques with complementary flamework to create historical portraits. The new use of exterior carving created a sculptural engraved plaque, as well as other plaques. The flamework elements become more important in reinforcing the meaning in portraits and all other designs. 2000 – Created a new vocabulary to talk about the work and now refers to the process as “flamework encasement.” Millefiori is also developed to be expressive and reinforce the main design. Introduced texture in the design through fiber-filament grounds (a new type of background for encased designs). This transition used glass millefiori to create fractal-like images and patterns out of millefiori based on studies of DNA molecules or biological cells; they are now represented in millefiori patterns in the new work. 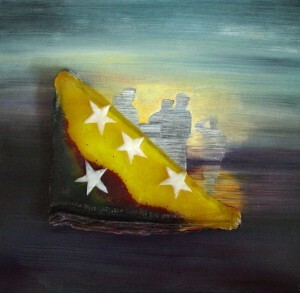 2001 – Return to artistic roots, began painting in oil again. Abandoned the concept and conventions of paperweights by a change in thinking that adopted the ideas in sculpture. Debbie created exterior forms enclosing painterly, contemporary, design motifs and abstractions. DNA helixes with human profiles and abstracted snakes sliding in rivers of ribbon millefiori were typical designs. This experimentation led to collages containing many elements and abstract patterns. Painterly motifs were combined with abstracted canes emerging in the concept of combining techniques to create a multi-media art work. 2002 – Used original Debbie Tarsitano paintings as design sources for multimedia works combining oil paintings and complementary sculpture in glass. 2004 – Experimented with hot sculpting in her Westford studio progressing to other defined as well as free form hot sculpted glass shapes. Presenter at the Glass Art Society conference, created a hot glass free form sculpture in a public demonstration. 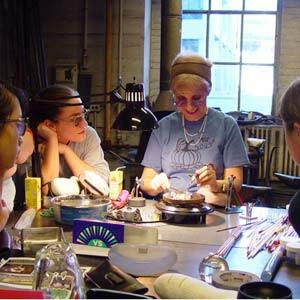 2005 – Taught at the Studio of the Corning Museum and met fellow instructor Dino Rosin, who introduced Debbie Tarsitano to hot glass sculpture. This meeting resulted in a collaboration in which Debbie and Dino made “Lens Fantasia” (a 35 pound sculptural lens with encased flamework). 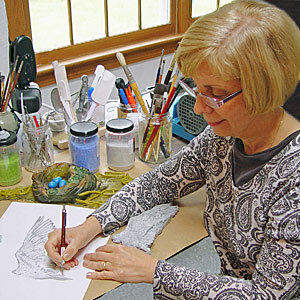 Subsequently, Debbie created several lens shaped sculptures in her own studio. Began creating abstract crystal sculptural shapes encasing flameworked designs (abstract human profiles and other contemporary design elements) adding complementary external oil painting and applied flamework on the exterior of the sculpture. 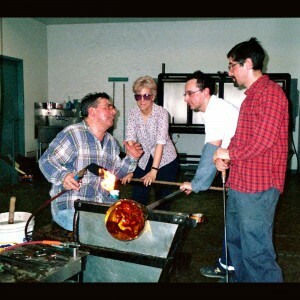 2006 – Participated in an engraving and sculpting class at The Studio of the Corning Museum of Glass with Jiri Harcuba and Martin Rosol as instructors. Expanded studio capabilities to include a wide range of cold working techniques and added textural surface treatments and sculpted designs to the outside of crystal artworks using sandblasting, sculptural cutting, and diamond wheel engraving equipment. Set up cold working shop in the studio. Began to create sculptural jewelry and vitreographs. 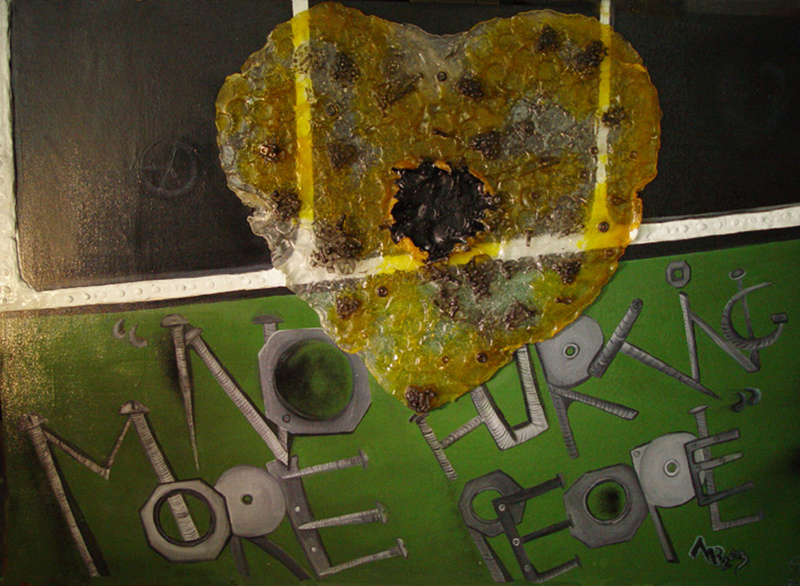 2007 – Direction of the studio completely refocused on sculpture and painting. 2008-2011 – Direction towards using mixed media; combining paint canvas and glass as well as hot and cold sculpting to reinvent the portrait. Pate de Verre sculptural glass. 2013 Full time working with pate de verre glass, kiln formed sculpture. Creating smaller versions of large sculptures as wearable art. 2016 Combining cast glass, painting and photographic elements in collage works of art.